Since my last two OSX Hidden Gem posts, OSX has gone up a version and many OSX users have entered the brave new world of Leopard. Leopard has been an interesting release. Not as major as some would have hoped yet still interesting enough to warrant the entrance fee. Just like the previous Hidden Gems articles, this one highlights some of the little things in OSX Leopard that delight me. Things that may not have received much attention elsewhere, but deserve it. A quick disclaimer, I don’t currently have a pre-leopard build to try out, so I don’t know which of these features are new to Leopard. All I know is that they are all present at the moment and I don’t remember seeing them pre-leopard. Spaces is one of those features that became instantly essential. I can’t really imagine using OSX without out. I tend to have six spaces, all being used at any one time. Typically I use spaces to separate development, mail, web browsing and any apps that require allot of screen real estate, such as photoshop. The drawback of spaces, however, is that you can very quickly become overwhelmed by the amount of open windows. Luckily, Apple has you covered. They very cleverly enabled Expose while in spaces view. This spreads out all your applications, within their respective spaces so you can see exactly what you currently have open. To take advantage of this, enter spaces view (I have this configured to the top right hand corner of the screen) and while in this view, do whatever you normally do to enter expose (I have it configured to the bottom left hand corner of the screen). You’ll see all the open windows and moving your mouse pointer over each will reveal the window’s name. If you have more than a couple of active spaces, this will become a much-used feature. Admittedly, this is more eye candy than anything else, but some of the new screen savers are really nice looking. 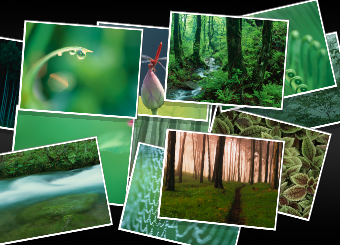 I’m a fan of the new collage and mosaic screen savers which take photos from your iPhoto library, or any other folder, and arrange them in simply stunning ways. I’ve found it nice just hooking my mac up to my TV and leaving the screensaver running. It’s actually a great way to enjoy your photos. I actually can’t believe a feature this powerfull has been included in an operating system as a matter of course. 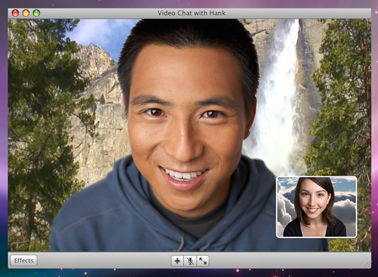 In the run up to Leopard being released, Steve Jobs demonstrated on stage the ability to dynamically add backdrops to iChat conversations. Which was nice. What seems to have gone largely unnoticed however, is the ability to use this within Photo Booth. So what does this mean? Simply, this means that you can design a backdrop in a tool like Photoshop, import it into Photo Booth and record a video of yourself appearing in front of it. This is the sort of thing that has previously been restricted to video professionals with powerfull editing equipment and over-sized brains. Admittedly the results aren’t exactly professional, but if you make sure your body has enough contrast when compared to the objects behind you, it actually works ok.
I’m in the process of writing a post which uses this feature, and other ready-to-go OSX, iWork and iLife functionality to make a pretty convincing TV show. Well, a “good enough for You Tube” TV show anyway. I’ve pointed out some really small, seemingly minor pieces of functionality in previous posts, but I truly believe that it’s the combination of 100’s of these little touches that make OSX so special. An example I’ve come across in Leopard, that I certainly don’t recall from Tiger, is the fact that renaming now distinguishes between file names and file extensions. If you select a file and press return, the file’s name becomes editable and is automatically selected. Previously it would be the entire file name and extension that was selected for editing, now it’s just the file name. This, while sounding minor, is actually a big time saver. I tend to rename a lot of files. Not enough to warrant an automator action, but enough for me to notice a change like this. It’s the difference between hitting return and typing the new file name and hitting return, de-selecting the extension and then typing. If this list was being judged on coolness, I’ve saved the best till last. Leopard introduced a new synthesised voice, Alex, which speaks text in more natural tones which is easier to understand. 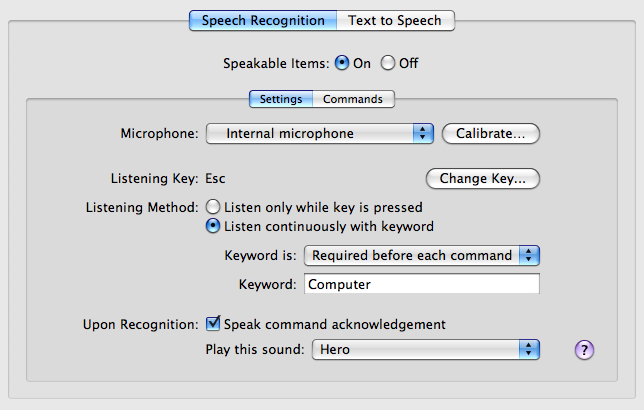 This isn’t the end of OSX’s speech functionality, it also goes the other way. OSX can understand you. If you head into the System Preferences you will find an option labelled “Speech”. This preference pane allows you to turn on and configure the speech recognition options. There are a couple of recommendations I’ll make. Firstly, go into the “Commands” options and select everything you want to enable as speakable. While in there, highlight the “Global Speakable Items” item and click configure. You’ll be presented with an option which tells OSX to attempt to match what you’re saying to a target phrase even if it’s been slightly reworded. So if the command is “Tell me the time” and you way “What’s the time” it will know what you mean. The other recommendation I would make is to turn constant listening with a keyword on. While you may rarely, if ever, use it, there will be a magical occasion where you’ll be sitting talking to someone next to your computer and they ask you what the time is. If this opportunity ever comes up, don’t pass on it. All you’ll have to do is tap your chest and say “Computer what is the time?”. Your Mac will beep and then tell you the time. Optionally follow up with a “Beam me up Scotty” and wheel out of the room in your office chair while making the funny wavey transporter noise. You are now the coolest person alive (in your own head). if you do want to try out the speech recognition, just have a play around with it. It takes a bit of practice to get it working consistently, but can be worth it. For an added bonus, try saying “Tell me a joke”. 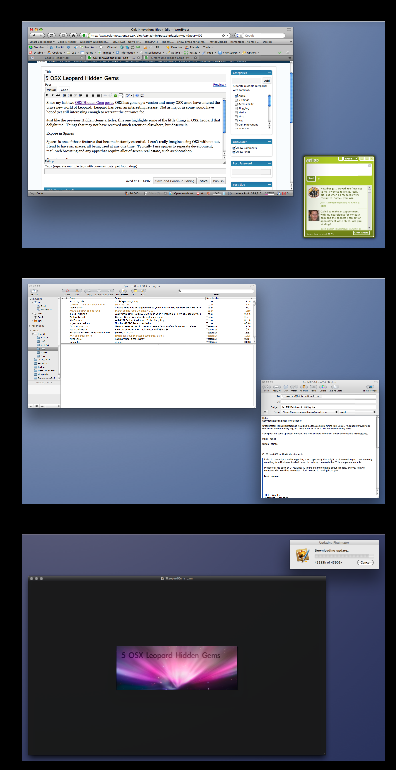 If you liked this post you may also like the original 5 OSX Hidden Gems and the followup 5 More OSX Hidden Gems. Did I miss anything? What little things in OSX make it special to you?